Breakup Notifier creator Dan Loewenherz should just give up on Crate (his actual job) and just make a whole network of these types of things. After having his wildly popular app Breakup Notifier blocked by Facebook, Loewenherz has dusted himself off and is back in the game, trying to “turn a negative to a positive” with Crush Notifier. “So what does the popularity of Breakup Notifier tell us? I believe it’s that human beings, above all else, value relationships. 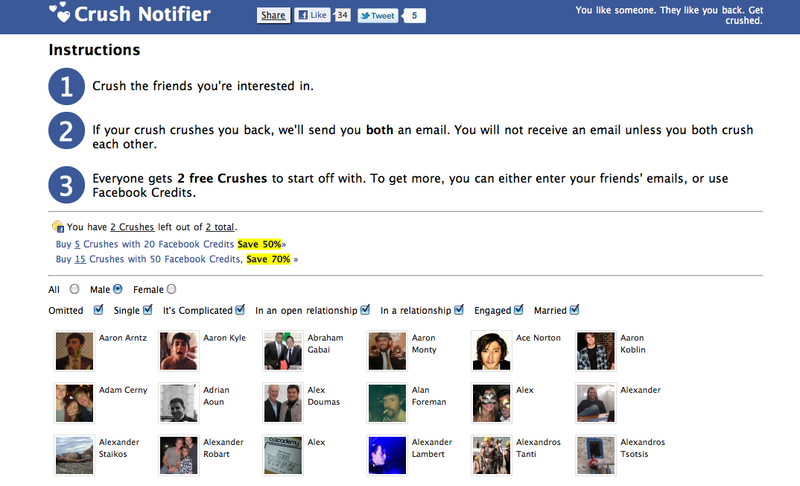 I never knew how many people would end up using Breakup Notifier. Soon after it a traffic peak, Facebook cut off our API access, and “permanently disabled” our application. This was a huge bummer for me. It was 4:30am for me, so I couldn’t really do anything about it until I woke up a few hours later. Since that time, Facebook has only responded twice to us; even now, we still don’t know why we were banned. Since we don’t know the reason we were disabled, that means we don’t know what we should do differently, and for that reason we can’t turn back on Breakup Notifier. Unlike Breakup Notifier, which sent you an email if selected friends had changed their relationship status, Crush Notifier (on a more positive note) allows you to choose people that you are crushing on (you can buy “Crushes” with Facebook Credits) and sends them the below anonymous notification email, replete with a cute love-related quote. If the feeling is mutual (i.e. if the person you’ve selected also selects you) you get a similar email notifying you of your match. “I’m a fan of creating relationships more than I am ending them,” says Loewenherz. Let’s hope Facebook can keep its hands off this one. Update: Loewenherz tells me that interested TechCrunch readers can sign up for a special “15 Crushes for 10 Facebook Credits” deal after creating an account, here.